That challenge was accepted. 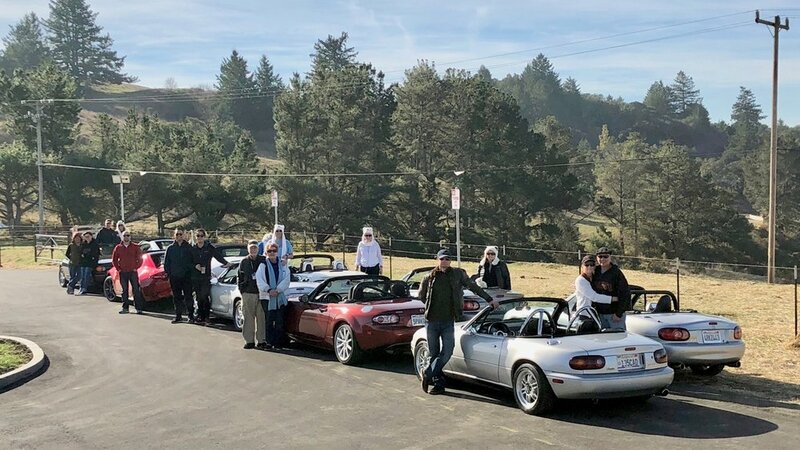 Eighteen from BAMA and two guests from LA, 18 in all, in 10 Miatas, and one OTM (it was a Mazda at least) braved the sunshine and temps in the mid-60’s to drive top down on New Year’s Day. Some of us wore polar bear gear and had polar bear mascots to celebrate the challenge. We met at Woodside Plaza in Redwood City, CA and around 10:30 am drove the seemingly ‘made for Miata’ twisty, curvy road over Skyline Drive to La Honda Creek Open Space Preserve, Woodside, CA. Sears Ranch Road Parking Lot and Lower La Honda Creek is now open. There are miles and miles of hiking trails on the preserve, however, this time we only stopped for the breathtaking views and photo ops. Reluctantly we left the Preserve and headed to the very eclectic San Gregorio General Store for more photo ops, rest stop and provisions. From the General Store we headed towards Half Moon Bay and lunch at the 3-Zero Café at Half Moon Bay airport. The café was quite busy and we enjoyed watching the small aircraft take off and land, as well as each other’s company, while we waited for our lunches. The food was outstanding, well worth the wait. From there we went our separate ways enjoying other twisty, curvy roads on this spectacular CA New Year’s Day. We welcomed in 2018 doing our favorite thing, driving our Miatas. Zoom Zoom.